How unbalanced was MSNBC's tag team tonight? When Keith Olbermann felt himself getting verklempt over Michelle Obama's speech, he threw it, for some fair-n-balanced commentary, to . . . Chris Matthews. 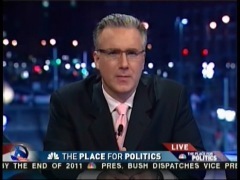 At the conclusion of Mrs. Obama's appearance, Olbermann almost seemed ready to call the election off and just hand the presidency to Obama by acclamation. KEITH OLBERMANN: Ye-a-h-h-h. Case closed. Matthews responded with a very guttural "uh-h-h-h."
OLBERMANN: That could not have done better for them. That could not have done better for them. Right to the point of the little girls taking the mikes away and suddenly turning out to be hams. It's wonderful. It really was terrific. And notice, did you notice throughout that, especially as it built towards its conclusion, the woman in that convention hall--the ones we saw at least--we can't say every one--but there were tears throughout among the women. And it was not a maudlin speech, it was not a salesmanship speech. There was just a -- I know, I'm beginning to sound borderline sycophantic on this. So I'll stop. You start. As John Podhoretz has observed, the highlight was the adorable interaction of the girls with their father on the video screen. As for Michelle's speech itself, I found it lacking in affect and authenticity. One sensed that the handlers, so concerned about avoiding an "angry" moment, had baked the life of it. But it was enough to move Olbermann into admitting that he's in the tank.